A treble from forward Jack Langford helped Littlehampton Town record a thumping 6-2 SCFL Division 1 win over Oakwood. Zach Harris, Darren Bowell, and Liam Humphreys were also on the scoresheet as Golds secured a first win in three attempts against Oaks. The hosts got off to a great as they took the lead inside 12 minutes through Zach Harris. Langford grabbed his first 15 minutes later, slotting the ball past Oakwood’s goalkeeper Jordan Markey to double Golds' advantage. Littlehampton scored their third on 33 minutes through Boswell and a fourth followed three minutes before the break with Langford getting his second. Oakwood pulled one back when Gerald Manville put the ball past James Askew four minutes after the restart. 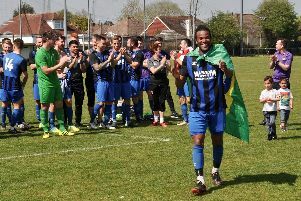 Humphreys restored Littlehampton’s four-goal advantage on 55 minutes but Oakwood reduced the deficit once again 18 minutes later as Charlie Adsett struck. There was still time for Langford to complete his hat-trick eight minutes from time to give them three points and leave Littlehampton sixth in the table. Golds are without a game this weekend and return to action when they host Billingshurst on February 23.